One of the more common band bio mistakes is including a list of the bands that each member used to be in; because honestly, no one cares that your bass player was in Chocolate Shotgun. You know who thinks it's awesome that your singer also plays guitar in a Rap Rock band called Ginocyde? Your singer, his girlfriend and the 2 guys that always show up to watch them practice, but never go to a show. However, if you're Masada, you can feel free to namedrop Immolation in your bio because people actually like that band. Now that your interest is piqued and your attention is all mine for the moment, let's talk about Death Metal! The opening riff in “Hideous Cerebral Pulp” lets you know right away that this is old school Death Metal. In fact, let me not use that term; this is “classic” Death Metal circa 1993. It's Death Metal like you want it to sound; raw and angry with a bunch of tempo changes and memorable riffs. It's painfully obvious that there is no danger of a chugga-ch-chug-ch-chug breakdown coming up. If that last sentence turned you off, you are clearly on the wrong site and this EP probably isn't for you either. No doubt about it, this is straight-forward, bludgeon your face with heavy riffs, Death Metal. And then the second track starts. Touted as a “bizarre” contribution from Clive Jones of (literally) old school band, Black Widow, “Fluteotherapy” is nothing if not bizarre. I could string a bunch of words along and try to paint a verbal portrait of an insane interlude track, but I'm just gonna tell you what it sounds like: someone masturbating while simultaneously trying to figure out how a flute works. Love it or hate it, but it is what it is and that's what you're working with here. In all fairness, I do somewhat miss the days when Death Metal bands threw in weird stuff out of nowhere, so I don't mind this too much. Anyway, back to the Death Metal! 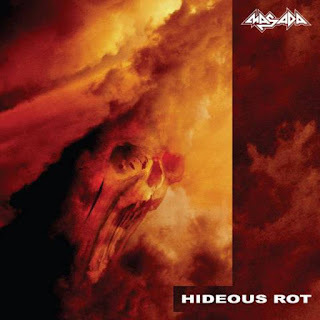 “Exist To Rot” shows Masada hitting you with virtually everything they can fit into the span of just over two minutes. Here again, is classic Death Metal, but then a catchy, mid-tempo riff towards the halfway point gives way to an exquisitely dirty bass-line and melodic lead guitar passage. Very nicely done. The final two tracks were recorded as a two-piece and have been on the band's Bandcamp page for quite some time. It was these same two songs that got me interested in the band in the first place. This is an EP that does what it's no doubt intended to do, generate interest in a full-length Masada album. I'm interested and you should be too because if the Metal world needs anything right now (it does) it's more no-frills, raw Death Metal like it was back in the days before skinny jeans and energy drinks got thrown into the picture. Rating: 7/10 – Snag a copy of this if you want some Death Metal without pretense.